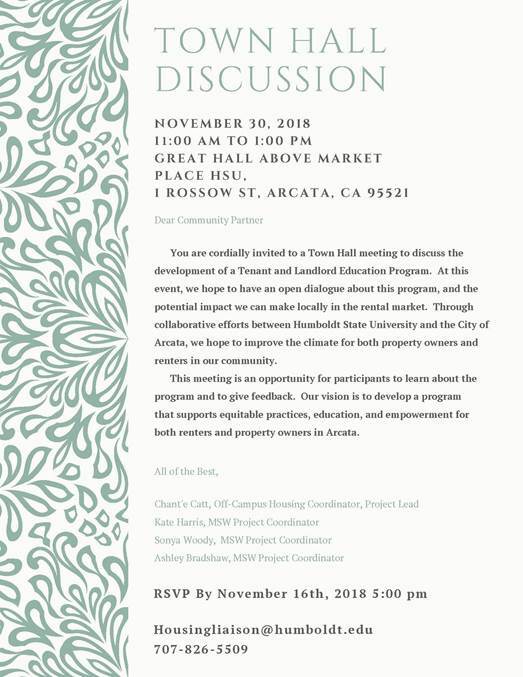 Humboldt State University and the City of Arcata are hosting a Town Hall Discussion on November 30 regarding a new Tenant and Landlord Education Program. The community is invited to attend to learn more about the proposed program and give feedback. Organizers also want to hear specifically from landlords and tenants about frustrations and positive experiences, all with a goal of improving the climate for property owners and renters in the community. Through the years housing in the area has had its ups and downs. This Town Hall Discussion is an opportunity to have a deeper, more inquisitive conversation around housing here in Humboldt. We will be utilizing the Liberating Structures Facilitation Model, and gifts from the heads, hearts, and minds of many. Please check out their flyer HERE to learn more about the event and ways to offer input as a tenant or landlord. Townhall attendees are asked to RSVP by 5 pm on November 16.